Micropor. Mesopor. Mat., 229, 44-50 (2016). DOI: 10.1016/j.micromeso.2016.04.019. Solid sorbents for chemisorptive carbon dioxide uptake in post-combustion scenarios require strong binding groups like amines. Post-synthetic impregnation of reactive amines requires large pore volumes. 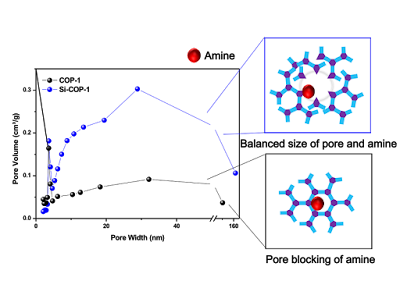 Covalent organic polymers (COPs) are microporous (or narrow mesoporosity) network polymers with physisorptive behavior. 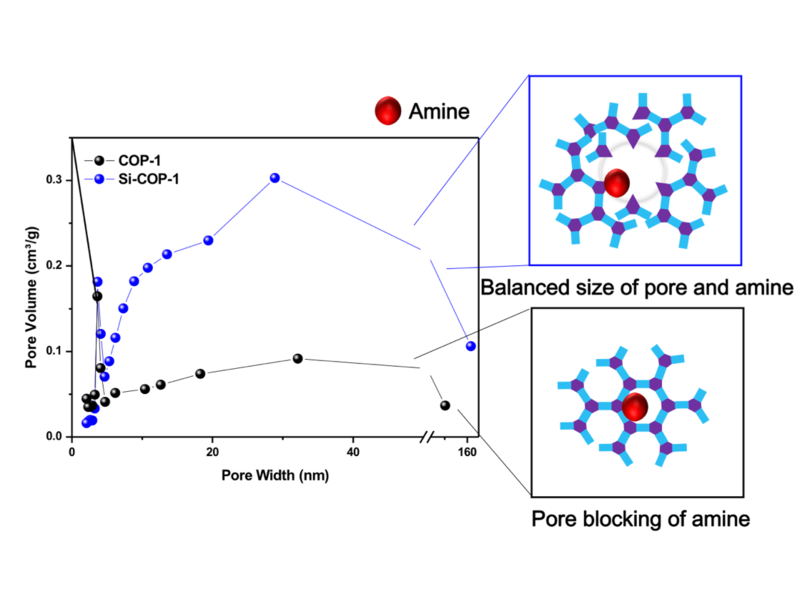 Herein as the first of such attempt in porous organic polymers, we modified COP-1, which is an inexpensive, scalable porous polymer for effective amine loading. By expanding the pore of COP-1 through hard templation by silica, the surface area and pore volume are increased by 2.3 and 2.9 times, respectively. It was shown that the increase of pore volume was mostly from pores larger than 5 nm and it correlates well with the silica particle size (12 nm) and the inter-particle pore sizes of silica (31 nm). As a result, amine impregnated Si-COP-1 adsorbs CO2 with the increase of 2.44 at 273 K and 4.06 times at 298 K (at flue gas relevant partial pressure of 0.15 bar) over the parent COP-1. Our results show the possibility of tuning porosity for developing industrially feasible CO2 capturing sorbents.